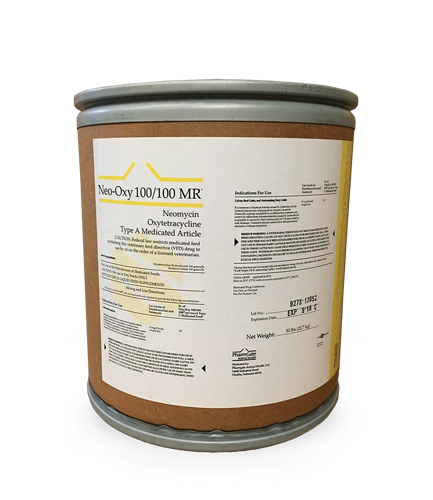 For Calves (Up to 250 lb) (Milk replacer): Treatment of bacterial enteritis caused by Escherichia coli susceptible to oxytetracycline; treatment and control of colibacillosis (bacterial enteritis) caused by susceptible to neomycin. Feed continuously continue 24 to 48 hours beyond remission of disease symptoms. RESIDUE WARNING: A WITHDRAWAL PERIOD HAS NOT BEEN ESTABLISHED FOR USE IN PRERUMINATING CALVES. DO NOT USE IN CALVES TO BE PROCESSED FOR VEAL. A MILK DISCARD TIME HAS NOT BEEN ESTABLISHED FOR USE IN LACTATING DAIRY CATTLE. DO NOT USE IN FEMALE DAIRY CATTLE 20 MONTHS OR OLDER, INCLUDING DRY DAIRY COWS. USE IN THESE CATTLE MAY CAUSE DRUG RESIDUES IN MILK AND/OR IN CALVES BORN TO THESE COWS. WITHDRAW 5 DAYS BEFORE SLAUGHTER. USE OF MORE THAN ONE PRODUCT CONTAINING NEOMYCIN OR FAILURE TO FOLLOW WITHDRAWAL TIMES MAY RESULT IN ILLEGAL DRUG RESIDUES. For Calves, Beef Cattle, and Non-lactating Dairy Cattle: Treatment of bacterial enteritis caused by Escherichia coli and bacterial pneumonia (shipping fever complex) caused by Pasteurella multocida susceptible to oxytetracycline; treatment and control of colibacillosis (bacterial enteritis) caused by Escherichia coli susceptible to neomycin. Feed continuously for 7-14 days in feed or milk replacers. Treatment should continue 24 to 48 hours beyond remission of disease symptoms. Ingredients: Oxytetracycline hydrochloride, neomycin sulfate. Type A Medicated Article for use in the manufacture of medicated dry feeds (not for use in liquid feeds except milk replacers). Category II drug; requires a feedmill license (not required for Type B and Type C medicated feeds).